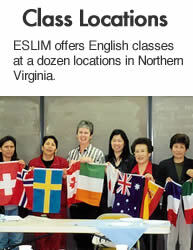 ESLIM is a consortium of churches that offer English classes to immigrants and other non-native speakers in the Northern Virginia/Washington, D.C. area. 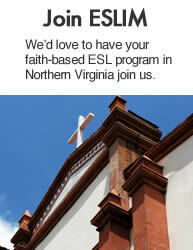 In operation since 1989, we are one of the oldest non-profit English as a Second Language programs in Northern Virginia. 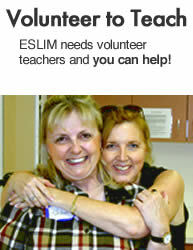 Our classes are taught by trained volunteer teachers in multiple locations in Annandale, Arlington, Ashburn, Centreville, Chantilly, Clifton, Fairfax, Falls Church, Leesburg, Manassas, Reston, Springfield, and Washington, D.C.
Our program is a ministry of the United Methodist Church, but membership is open to churches of all denominations. 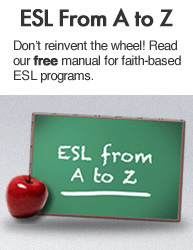 We welcome students of all faiths and beliefs.